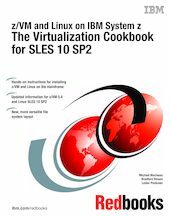 This IBM Redbooks publication describes how to roll your own Linux virtual servers on IBM System z hardware under z/VM. This edition applies to Version 5, Release 4, Modification 0 of z/VM (product number 5741-A05) and Novell SUSE Linux Enterprise Server (SLES) Version 10, Service Pack 2 (SP2). With a z/VM and Linux infrastructure, you can reduce the time between deciding on the acquisition of new servers and then implementing them because new servers can be deployed in a matter of minutes. This powerful build and clone capability can enable you to launch new products and services without the exhaustive planning, purchasing, installing and configuring of new hardware and software that can be associated with conventional discrete hardware servers. Development groups that need test environments built and rebuilt rapidly to enable them to efficiently deliver their projects, while handling change management in the process, can also benefit from this unique advantage. The publication adopts a cookbook format that provides you with a concise, repeatable set of procedures for installing and configuring z/VM in a logical partition (LPAR), and then installing and customizing Linux. To implement these instructions, you need an IBM System z logical partition with associated resources, z/VM 5.4 media, and a Linux distribution. This book assumes that you have a general familiarity with System z technology and terminology. It does not assume an in-depth understanding of z/VM and Linux. It is written for those who want to get a quick start with z/VM and Linux on the mainframe.